Washington (CNN) - Most Americans don't agree with Karl Rove's questioning of Hillary Clinton's health and age, according to a new national poll. And an ABC News/Washington Post survey released Wednesday also indicates that a majority of the public says they'd support Clinton if she makes a second bid for the White House. The former secretary of state is seriously considering a presidential run in 2016 and says she'll decide by the end of this year. If she launches a campaign, she would instantly become the overwhelming front runner for the Democratic nomination. According to the poll, two-thirds say they disapprove of Rove's comments, with 26% saying they approve of the Republican strategist's questioning of Clinton. Earlier this month Rove, who was the top political adviser to President George W. Bush and the mastermind behind Bush's 2000 and 2004 presidential election victories, raised questions about Clinton's health and made headlines with some controversial comments about her 2012 concussion. Clinton suffered a blood clot in December 2012 as the result of a fall. After first going to the hospital for testing, Clinton later was admitted for a three-day stay at a hospital in New York. Rove, a Fox News contributor, earlier this week also raised questions about Clinton's age, describing her as "old and stale." If Clinton, 66, is elected president in 2016, she will be 69 years old, just a few months younger than the nation's oldest elected president: Ronald Reagan. Democrats have charged that questioning Clinton's age is sexist and out of bounds. The poll indicates an expected partisan divide: Eighty-four percent of Democrats and 64% of independents say they disapprove of Rove's comments, with Republicans divided. By a 52%-43% margin, registered voters say they would support the former first lady and senator from New York as a candidate for president. Again, there's a wide partisan gap, with 83% of Democrats, 51% of independents and only 26% of Republicans saying they would support Clinton as a White House contender. The poll also indicates Clinton's husband, former President Bill Clinton, remains popular with the public. Sixty-three percent of those questioned say they have a favorable opinion of the former president, with 32% saying they see him in a negative light. Bill Clinton's favorable ratings have stood in the 60s in most national polling conducted over the past couple of years. The ABC News/Washington Post poll was conducted May 21-25, with 1,017 adults nationwide questioned by telephone. The survey's overall sampling error is plus or minus 3.5 percentage points. How do people like Karl Rove explain their vile comments to their kids who should look up to the papa for a better America. you expected the union teachers to not sabotage the whole thing? @ Lynda, well, don't get him too riled up, since he will accuse you of doing Sniffit's bidding. Oh, is recess over then? Ah, well. Back to the garden I go. BTW Tom Paine: welcome back. I always enjoy reading your comments. CNN, the photo you have used of Karl Rove doesn't match at all with this article you have written. What we know there are photos of Karl Rove which show him crying. And you use this photo him laughing? Laughing at who? What message are you sending to people? That he is laughing at us because we are saying he is wrong? Can you please apply what you have learnt in being journalists? Karl Rove could play Elmer Fudd's stuntman in this Summers block buster Looney Tunes movie " Wabbit Twouble "
What intelligent young person would want anything to do with Rove and his style of deception and marketing . 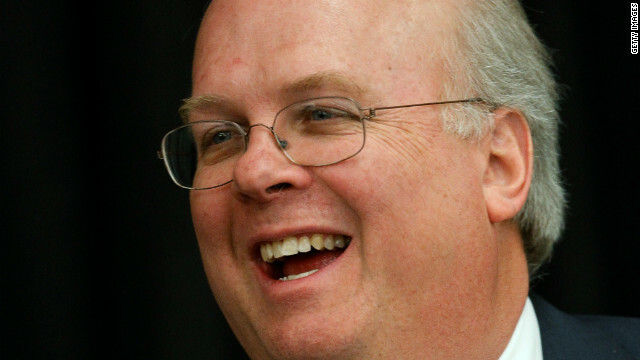 Republican strategist Karl Rove predicts Mitt Romney will win the election with at least 279 electoral votes. The man who had the Ohio meltdown and showed the world what a big time Koch fool he is continues to open mouth and put foot in it.